We’re stoked to premiere the new single from Melbourne garage-rock trio The Rollercanes - ‘Cost of Living’ is a raucous rock ’n’ roll blast, that tackles a far more sensible dilemma beneath the layers of fuzz and noise. It hasn’t even been a year since the release of their debut album Less The Love Between Us, but local rockers The Rollercanes are back at it again. While the band describe the first album as ”scratchy”, having recorded it between studios, rehearsal rooms and bedrooms with just $17 between them, ‘Cost of Living’ finds the band honing in on their sound and offering up their most mature music yet. The track opens in a relatively restrained manner, with some muted guitar chords and mild drums, before the band suddenly blast into a wall of fuzzed guitar and pummelling drums, and vocalist/guitarist Daniel Wright stretches his gloriously untamed voice out. With a melody that wouldn’t feel out of place on a Vasco Era album backed by a classic rock ’n’ roll groove, the track jets along before shifting into a careening guitar break. Soon enough, we’re hit by another chorus that feels even wilder than the last, followed by an intense bridge that takes everything up an extra notch with its propulsive beat and wailing guitar leads. We’re offered a quick chance to catch our breathe as things cool off for a moment, before The Rollercanes kick back in for one more rollicking chorus and then ride the track out. To celebrate the new single, The Rollercanes are hitting the road to give the rest of the country a taste. Check out the tour dates below. 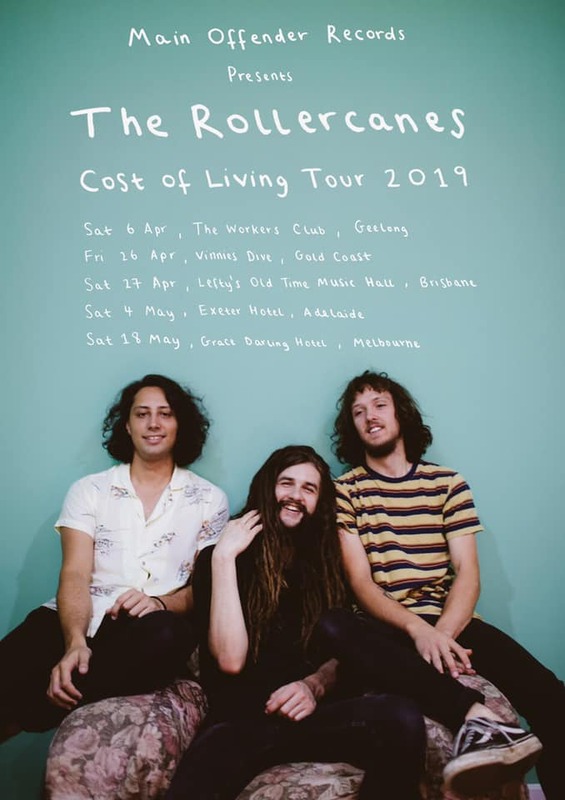 Check out 'Cost of Living' above, and catch The Rollercanes out on tour over the next two months in support of the new single.